When people in Texas speak fondly of Oklahoma, it’s usually about the gorgeous scenery of the eastern edge of the state. While that area is all great and beautiful, I found a little piece of heaven on the southwest side called Wichita Mountains Wildlife Refuge. Wichita Mountains is a US Fish and Wildlife Service managed piece of property that is a refuge for bison, wild turkey, and elk. I was browsing through the blog of a cool local hiker/trail runner and saw his review and recent visit and knew I needed to head up there myself. It was only about three hours away, a perfect little Sunday drive, and offered some varying terrain according to his post and the research I did. So, I picked a Sunday at the end of April and set out to explore. The drive out of Texas always feels like it takes forever and the drive out of Texas into southwestern Oklahoma truly feels like you’ve gone nowhere. The plus side, I saw some bison on the way in, just hanging out, so that was cool. I mean, I half expected to see bison but was still pleasantly surprised. I made a mental note that I’ll have to come back for a weekend to explore the place. I made my way over the cattle guards and on to the road that winds through the refuge east to west almost in the middle of it all. The road starts out in a field with a lake to the south and eventually becomes lined with small trees as the hills begin. There are several turnouts and roads leading to various picnic spots and trails, with the final one for me being the road that lead to the north trialhead for the Charon’s Garden trail. 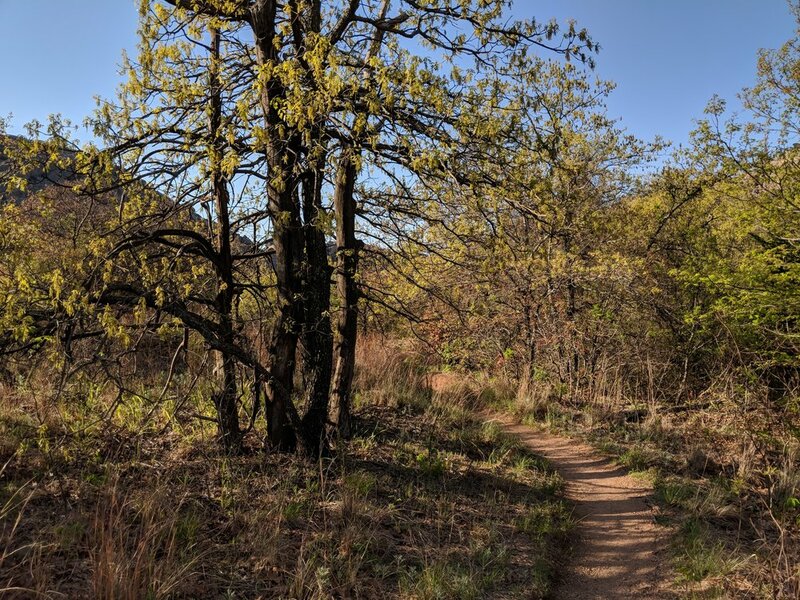 The trails I planned to hike were within the Wichita Mountains Wilderness area which is an 8600 acre area within the refuge designed to remain as wild as possible. Charon’s Garden trail is one of two designated trails in the wilderness and one I attempted to complete. The moment I parked and walked to the other parking lot, I laughed and realized I could have parked closer. The flow of a stream, the wind through the leaves, and the general lack of people were all very noticeable right away once I got to the actual trailhead. The sun was behind the rocks, and remained that way for the first part of my hike. The trails went through forests, across dried up streams, and through boulder fields. I was on the Charon’s Garden trail, almost to the boulder field where I gave up and turned back, and I saw it… a maple leaf. I was overjoyed, projected to an emotional high - over a leaf. You see, dear friends, I miss trees. I miss big beautiful trees. I see them, on occasion, but not often enough. Anyway, with the maples came a trickling stream and a boulder field. I have zero experience with big rocks, so I didn’t really mess around on them being I was alone and inexperienced. Overall, I only saw about 10% of the refuge but was so impressed I have it on my list for a fall return and hopefully again in the late spring. There is so much left to see, so many more boulders to actually tackle, and miles of trails left to hike. An unexpected gem in the middle of nowhere, Wichita Mountains Wildlife Refuge delivers on variety and nature. I tried my best in Paint to illustrate the crab eyes….